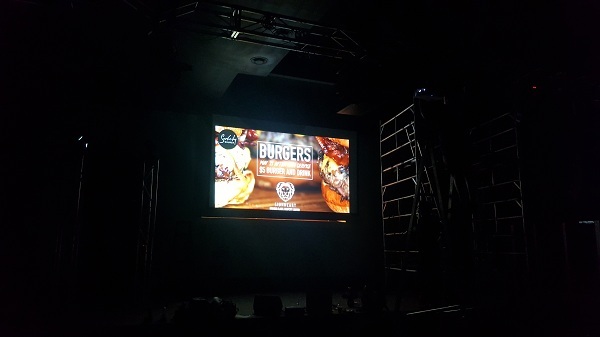 TV Magic were appointed to erect a monster 200 inch projector screen in a 20ft high ceiling auditorium - suspended from a false ceiling. The job was extremely interesting a slightly challenged as we were also instructed not to fix it to the back wall, yes it had to be offset of 40 centrimetres away from the back wall (so that lights could be projected up behind the projector screen) - leaving us with no other option other than you harness up and install pulleys and wire rope. 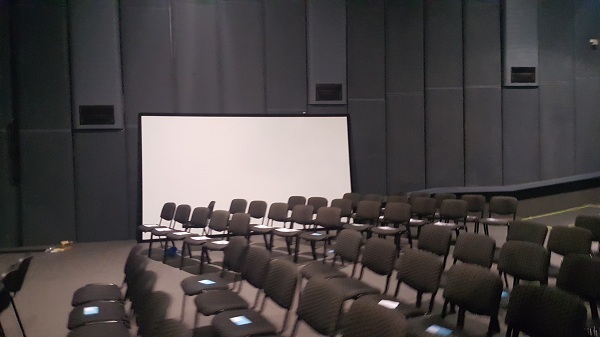 Depicted above:- Not too concerning for TV Magic as we have installed projector screens in many commercial applications however to give you a perspective of size here is the 200 inch projector screen; in the Surf City Church Auditorium. The photo doesn't do this monster justice. If someone were to be standing next to the screen - the screen would dwarf the person. The auditorium was dwarfing the screen. 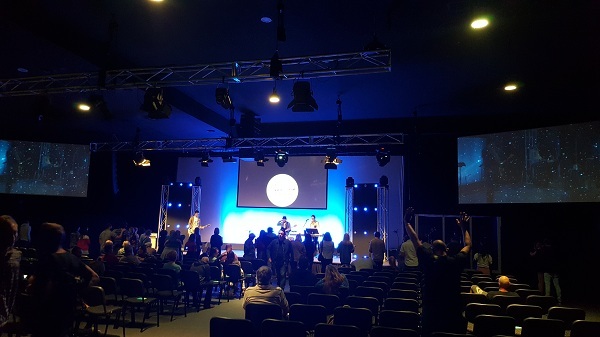 Our job was to perfectly allign it in the centre of the stage - at the exact same height as the two other screens and at an exact distance, away from the wall to allow lights to shine up behind the screen. The roof was 20ft high and had some obstacles in the way. It was also a suspended ceiling, meaning that a regular person cannot place weight on the plaster sheeting or beams without risking falling through. It was also approximately 20ft high meaning the risk was even more significant. 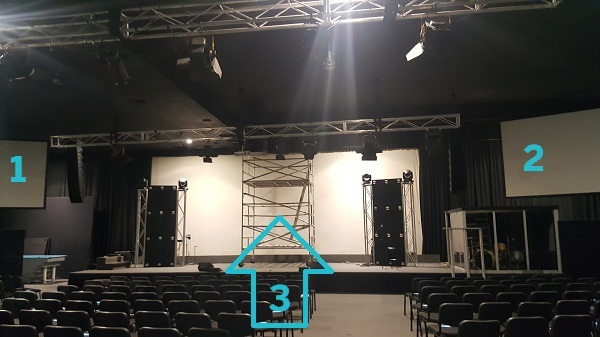 Pulleys were installed inside the very tight roof cavity and multiple measurements were taken using our state of the art equipment including led tape measures & floor to ceiling laser - levellers. A team of 4 then safely inched the screen up once all the clamps, fixings, and tethers were installed. Depicted above:- We were excited to see it in action before we even started cleaning up. This is with the lights off. 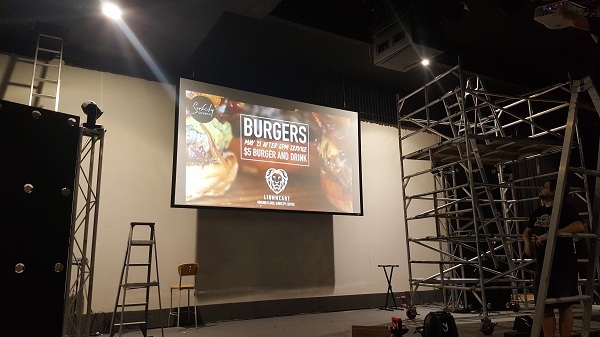 1x gorgoues 200 inch projector screen installation in the heart of Surfers Paradise. Depicted Above:- Now you can really appreciate all the effort we went to. How good does that look! That's right that wasn't a question mark. 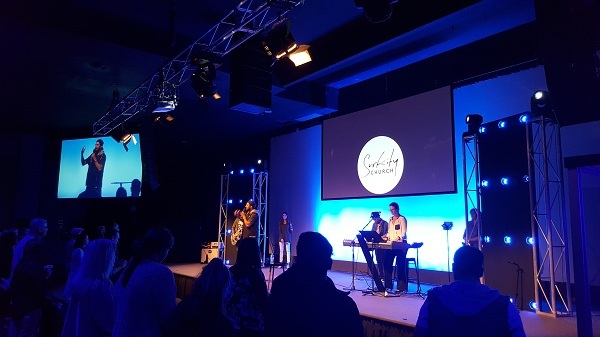 The team at surf city church were extremely pleased. We were stoked also. And there you have it from a distance, what an overall amazing display of screens. Now for the question:- Does that look fantastic or does that look fantastic?